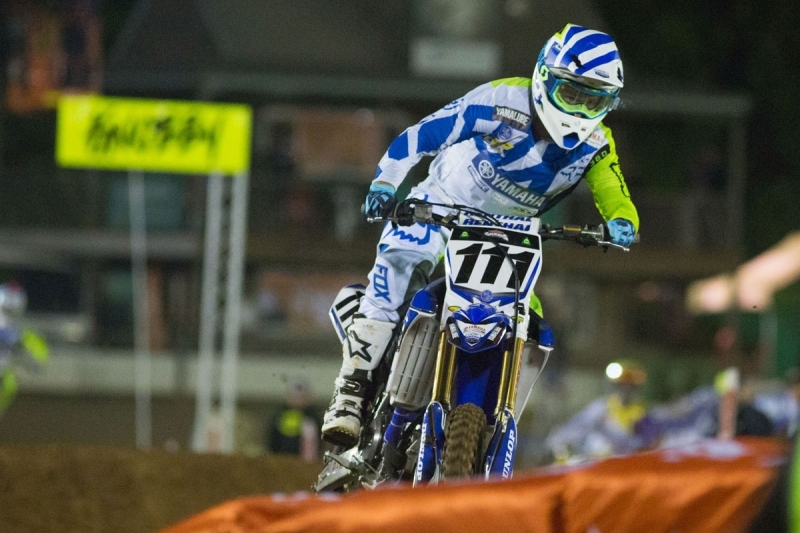 CDR Yamaha’s Dean Ferris has landed on the podium for the second round in a row after finishing third at round two of the Australian Supercross Championships, held at the Toowoomba Showgrounds on Friday Night. Despite dividing his time between supercross and recently representing Australia at the Motocross Of Nations, Ferris has shown some impressive supercross skills in his first two outings and the technical track in Toowoomba proved round one was no fluke and that the 26 year old Kyogle resident is a serious championship contender. He started the day strongly qualifying in fourth place, just .5 of a second off the leaders pace. He kept the momentum going with a second place finish in his heat and was confident of a good performance in the all-important 20 lap SX1 (450cc) main event. The opening five laps of the final saw some intense racing with riders swapping positions, making small mistakes and getting into heated battles as they jostled for positions. Ferris slotted into fourth early on behind Todd Waters and US duo of Kyle Peters and Wil Hahn. Waters went down moving Ferris to third before another US import, Justin Brayton, capitalized on a mistake from Ferris. Come the half way point, the main players made their move. Brayton sliced to the lead, followed by Hahn. Ferris made his move on Peters and set off after the US pair and shadowed them for the next eight laps. While he piled the pressure on and closed the gap considerably, Ferris was never close enough to make a pass and was forced to settle for third place. “I’m pretty happy with how things went tonight,” Ferris stated after the event. “The track was tough and the strong winds just added to that so doing perfect laps wasn’t possible. You just had to be strong. “I tried to get onto the back of Wil but he rode the last half of the race really well while I made a few mistakes when I was in a position to make things happen. “All up it’s still great to be on the podium and make it two rounds in a row. Thank you to the CDR Yamaha team for the effort and support and together we are working to get a win at one of these things before the year is out,” Ferris ends. It wasn’t such a great night for team mate and current Australian Supercross Champion, Dan Reardon. Reardon quietly worked his way through the heats and progressed into the final with ease. He positioned himself well in the early laps of the main event in fifth place and right in among the freight train at the front of the pack. Unfortunately, just past the half way point, Reardon got loose in the whoops and then struggled to control his bike as he entered the following right hand turn. He couldn’t correct the bike and he fell heavily and took some time getting the wind back into his lungs and regaining his composure. To his credit, he got back on the bike and rejoined the race. He showed plenty of courage and managed to fight back to 11th place in what was a tough night for the reigning champ. “I’m not really sure what happened there, but I hear Todd Waters did the same thing just a few laps earlier,” Reardon explains. “We carry a fair bit of speed through the whoops and into that corner so when it goes wrong, it’s a pretty hard hit. “I’m pretty sore at the moment but will get onto any aches and pains early in the week to ensure I’m good to go for the Adelaide round in two weeks,” Reardon ends. Ferris and Reardon sit in second and fifth in the championship respectively and with four more rounds to come, there is sure to be plenty of movement at the top of the championship leader board. Both riders will now prepare for the Adelaide round on October 29 at the Showgrounds in the heart of the city. To follow the CDR Yamaha team on social media: www.facebook.com/cdryamaha or cdr_yamaha on Instagram.